Pete 'Bassman' Bain, one of the founding members of the UK cult psych rock band Spacemen 3, formed Alpha Stone after Spacemen 3 and his other band The Darkside split up in the mid-nineties. In 1996 the band recorded the album 'Stereophonic Pop Art Music' and it was released on Bomp! Records on Compact Disc. The album hasn't had a 'proper' vinyl release until now, 2018, when Hoga Nord Rekords continues their collaboration with Pete Bassman by releasing the album. 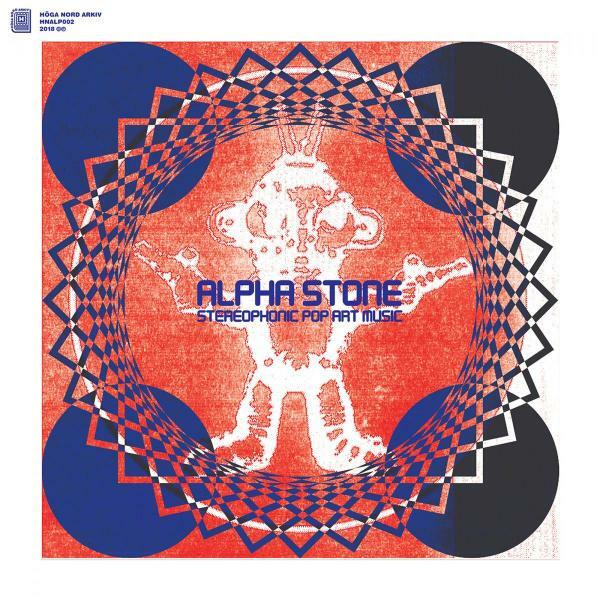 You can clearly hear that Pete Bassman was the driving force behind Alpha Stone; fuzz, synthesiser -sweeps, programmed drums and processed vocals are the cornerstones in Alpha Stone's sound. Raga-like mantras, heard in Farmer C, lies track to track with more percussion driven grooves and psychedelic pop oriented songs. The album's sound has obviously survived the 20+ years shelved in obscurity and proves the 'Drugby' sound still vital! It's always hard to sum up a bands particular sound in a few words, but you could say that if you put guitar and bass, synthesisers, a drum machine, and Julian Copes record collection in the hands of an alien, you've got Alpha Stone!